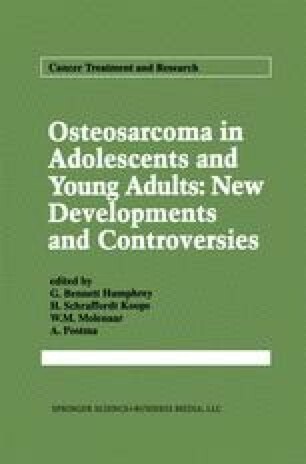 In 1980 there was considerable confusion surrounding the management of osteosarcoma. Those involved in the management of this disease were faced with a series of conflicts. The early promise of chemotherapy as initially reported by Jaffe appeared to have been logically extended by Rosen in a series of studies culminating in the startling results of T10 wherein over 90% of patients were disease free at 2 years. However, the use of chemotherapy in Europe was producing surprisingly little improvement in survival over that achieved by amputation alone. Both the E.O.R.T.C. Studies and that undertaken by the Medical Research Council (M.R.C.) in the United Kingdom were disappointing, although in retrospect it is clear that the intensity of chemotherapy was inadequate [1,2]. At the same time the Mayo Clinic was reporting a survival of 50% with surgery alone and no chemotherapy, one of their explanations being that the natural history of the disease had changed and that chemotherapy was no longer necessary .